SCOOP: Jimmy’s Seaside looks promising for original live music. There's an Open Jam on Wednesday night. MY TAKE: One of the main goals of Stamford Talk is to find good original music. I did some research (I called Jimmy’s) and was happy to find out that Jason Jones and the Stateline Blues Band were hosting open jam. I heard Jason’s previous band, Electric Hill, at Green's, and they had a great funk and blues sound. The good news: at Open Jam, you'll hear a wide variety of bands. This is the kind music I want- people listen to the music, right up close, and it’s not just a background for booze. The musicians write or improvise their own music, and you can say hi to the drummer between sessions. 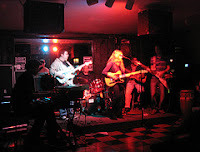 When the groove is right, usually later as things get a little fuzzy, musicians join up and jam with whoever is around. The bar is crowded in a good way. It’s fun to squeeze in for a beer and have a little harmless body contact with the person next to you. The bad news: Jason hosted his last session this week, and I’m sorry to have missed his music. However, Open Jam is still happening with a new host. I'm going to check it out on the 12th, and I hope many of you will join me. THANK YOU: To Shamik for his photo of Jimmy's. Check out Shamik's flickr set for a photograph of Jason playing guitar. VERDICT: Try Jimmy’s Seaside on a Wednesday. Don’t go too early; I’d try 10ish. It's a work night, but you only live once.